I have 2 weeks until A CUP OF DUST (my newest novel) is due to my publisher. People keep asking if the book is done. The story is done. The plot is formulated, the characters and dialogue as real as I can get them. I’ve cried over this book and fallen in love with my protagonist and sneered right back at the antagonist. So, yes. It’s done. But I’m scanning the manuscript, trying to catch every weasel word and misplaced punctuation marks. I’m trying to fix any dialogue that sounds stilted. I’m weeding the garden for anything that might strangle the plot. This is what I call the OCD edit. “My face was read.” Good grief. “I put out the bowels on the table.” NOW my face is red. “He watched me to watched me to make sure I made it home, he watched me all the way.” I need to sit down. I sit at my desk and read, speaking my novel into the air and hearing the words. I’m paying close attention to the dance the words make in certain sentences. I hope the ideas sing through the language I use. My old acting days are paying off as I’m playing the different parts: a 10 year old girl, a sheriff, housewife, grandmother, creepy dude. I’m hearing the voices of my characters. And it’s working to create a better story. 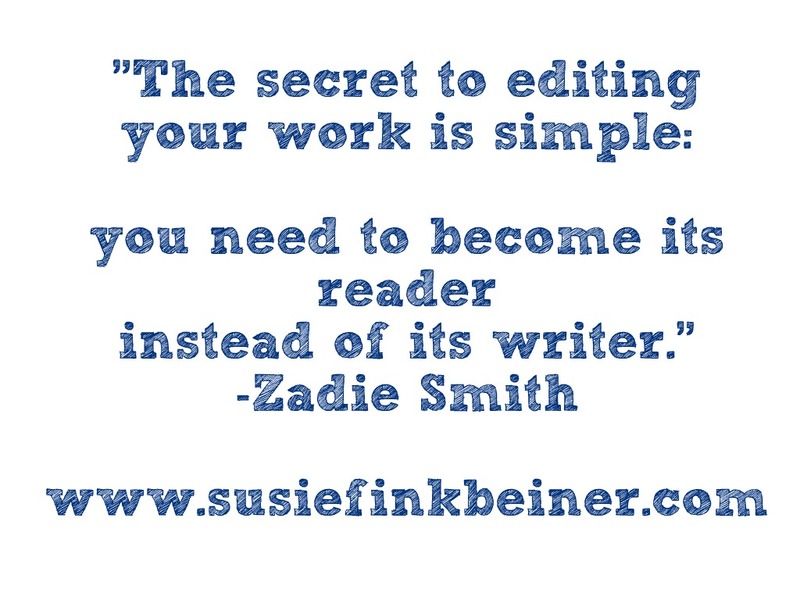 Many authors who I deeply admire do this very thing. They read aloud in order to hear their own novel. I’m so glad I listened when they said it’s a must-do for a writer. I’m just glad I don’t write Stephen King length novels. Tell me, please. What are your editing tricks? Have any embarrassing editing catches? Are you the reader who finds typos in big-name-author books? I absolutely love hearing from you. Reading out loud helps me, too, but earns snide comments from my wife. However, I catch more problems when I use text-to-voice software. Ha! When I’m at home alone I read in full voice. When family’s home I whisper. But no one can be in the room. I should try text to voice. Maybe on the next read through. Text-to-voice software with headphones and no one realizes what I’m up to! Oooo! Good tip! I’m doing that for sure! Yes! I read mine aloud, too. That helps so much. I’m so glad to hear of other writers who read out loud. My throat hurts, but it was well worth it. How fun that your daughter notices that. She must be very observant! And good for you for reading with her. I think we as parents assume that teens don’t want us reading to/with them. It’s great bonding time.